A quick search suggests that this book has been reviewed for Cannonball at least eight times already, so it’s not like anything I say about the book is likely to be new or revolutionary (see what I did there). I don’t think there was ever any doubt that I was going to love this book, considering just how much I love the musical. 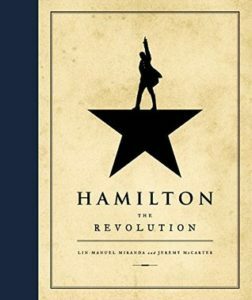 I don’t remember exactly when I first heard about Hamilton, but it’s likely to be early in 2016 (I got this as a birthday gift that year from my best friend, and then postponed reading it until spring this year, in preparation for seeing the musical live in London). Enough people I know on the internets (it’s where almost all my friends “live” now) were talking about it in such enthusiastic tones that I was curious. I discovered that the music was available on Spotify, and don’t think I’ve been so immediately taken with a musical since I first heard Les Miserables (another musical where I’d listened to the music countless times before I actually got to see it on stage. The first time I heard it, it was the Norwegian translation – not as good as the English, but still great). I had shivers down my spine, I cried buckets, especially during the second act. I’d listened to it more times than I could count by the time the husband and I visited New York in the summer of 2016, so when I saw this book in a bookstore, there was no question it was going to go on my birthday wish list. Share the post "Who lives, who dies, who tells your story?" I’m so jealous you got to see it!